Henryk Wieniawski Musical Society of Poznań brings together scholars, culture animators, artists, promoters of musical life and music lovers. It continues the tradition of the oldest secular musical association in Poznań, which was established on 2 May 1885 as „Koło Śpiewackie Polskie” [The Polish Song Community]. Under Prussian occupation (until 1918) it played a significant role in the preservation of the Polish language and song as well as defying the process of Germanization. After World War I, as Poznańskie Towarzystwo Muzyczne [The Musical Society of Poznań], it was one of the most active organizers of the town's cultural life. It had a renowned choir and even – for a while – its own orchestra and chamber music ensembles. World War II almost entirely obliterated the Society's material property. Several of its members lost their lives. Halted in 1939, activities resumed in 1945. First, the choir was revived, later to be followed by the instrumental section. At the beginning of the 1950s, the 100-person choir was the main performer of the Poznań Philharmonic's oratorio-cantata repertoire. Initiated in 1935 in Warsaw and held every five years, the International Henryk Wieniawski Violin Competition was moved to Poznań in 1952. One of the reasons for the move was the acoustic quality of Poznań University Auditorium; particular deference with which the competition Patron treated Poznań and the region of Wielkopolska (having performed here as many as sixteen times), was also taken into consideration. In 1957 its subsequent edition was held and, in order to retain the meetings of young violin players, the municipality needed an institution to take permanent responsibility for the event. Inspired by the town's cultural circles, it was Towarzystwo Muzyczne im. Henryka Wieniawskiego [Henryk Wieniawski Musical Society of Poznań] that assumed and still performs these duties. Established on 12 November 1960, on 17 February 1961 the Society merged with Poznańskie Towarzystwo Muzyczne; soon afterwards it initiated and became a joint organizer of International Henryk Wieniawski Violinmaker Competition as well as a founder-member of the World Federation of Music Competitions in Geneva. The Society also co-hosts national violin, viola, cello and double bass player, as well as violinmaker competitions. Henryk Wieniawski Society fosters the memory and disseminates knowledge of its patron. It collects documents and memorabilia, as well as publishes works on his life and work (it initiated the first edition of Henryk Wieniawski's Dzieła Wszystkie [Complete Works], whose first volumes have already been published). The Society also provides young musicians – violin players in particular – with different forms of promotion. It is also the patron to a chamber choir. For a number of years the Society has been one of the foremost organizers of musical life in Poznań, has inspired several events of international calibre, hosted numerous concerts, meetings and workshops run by outstanding artists, chamber ensembles and symphonic orchestras. One of the founders of the Society and its first chairman was Tadeusz Szeligowski. He was succeeded by Edward Statkiewicz, Stefan Stuligrosz, Mieczysław Dondajewski, Jadwiga Kaliszewska, Andrzej Wituski and Bartosz Bryła. Since June 2017, Alina Kurczewska has been the Chairman of the Society. 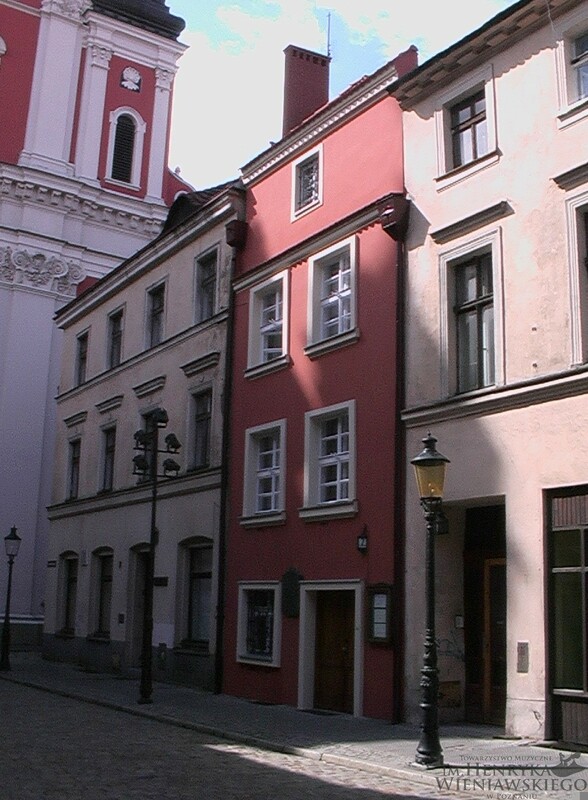 Włodzimierz Hubicki, Edmund Grabkowski, Zdzisław Dworzecki, Michał Merczyński and Andrzej Wituski have managed the Society's Office.